Speeding up video is often used in movies or TV shows to generate a comedic effect. If you are using Adobe Premiere Elements to edit your video clips, you can achieve the fast motion or speed up effect easily by following the instructions on the Guided mode. While in this article, we will show you other methods to speed up video to create a fast motion effect with Adobe Premiere Elements. When you're looking to speed up videos using the Adobe Premiere Elements, you can use two different methods: speed up videos with time remapping feature, or speed up videos with the time stretch feature. The first thing you need to do before you speed up video is to confirm its FPS. In order to use this method successfully, your video needs to be at least 60FPS. When you use a video that has a lower FPS, the video won't be able to play smoothly. Even though Time Remapping is a feature that is available in both Guided mode and Expert mode, we chose to use the Expert Mode for an example. 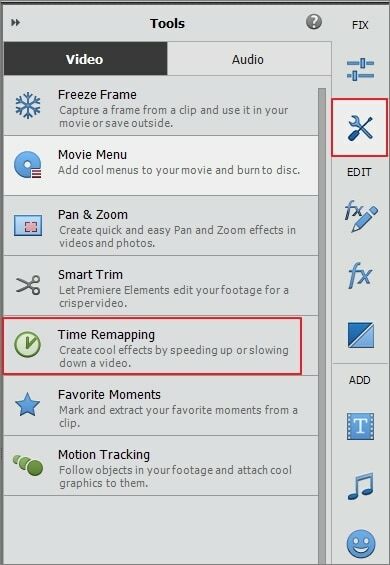 If you prefer to create a fast motion video in Guided mode, select “Fun Edits” tab in Guided mode and then follow the instructions step by step. 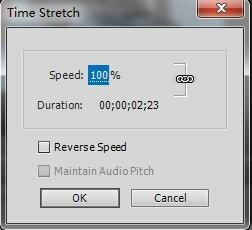 So, let's get started to speed up videos with Time Remapping in Expert mode in Adobe Premiere Elements. Step 1: After entering the Expert mode, the first thing you need to do is to import the video that you want to speed up. So, just click on Add Media and import the media from elements organizer, files and folders or other devices. Step 2: Drag and drop the video clips to the timeline. Step 3: On the Action bar, click on Tools and choose the Time Remapping tool. You can easily spot it on the tools panel. Step 4: Now, it's time to speed up your video. All you need to do is to move the playhead to the point at which you want to speed up video and then click Add TimeZone button on the Action bar. 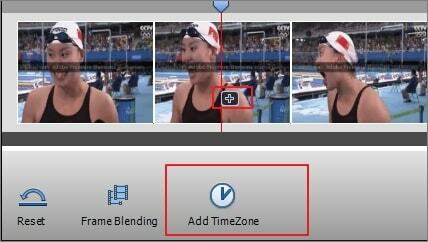 Or you can click the Plus icon on the clip to create a time zone. Step 5: In order to adjust your TimeZone selection, you will need to drag the handles that are located on the sides of the zone. Step 6: You will now need to move the slider to choose a play speed. This is where you can choose between slow down or speed up videos. To make a fast motion video, you can choose 2x, 4x or an extremely fast effect with 8x. What’s more, you can also specify the playtime in the duration box, and it will calculate the play speed automatically. Step 7: Click Done after setup is completed. You can see the new video that has now been speed up. One thing that you need to remember when you are using the Time Remapping feature is that you're only speeding up the video itself and not the sound. One of the disadvantages of using this method is that you can only speed up one video at the time. Step 1: Import the video clips. You can easily select the video clips in the Project Assets panel or click the Add Media tab to import the clips from files and folders or other devices. Step 2: Drag and drop the clips to the timeline and then right click the clip, select the Time Stretch option. Step 3: A Time Stretch dialog box should now be on front of you. In here, you just need to type the percentage for the Speed. Since you want to speed up videos, choose a value greater than 100%. In case you were trying to slow it down, you would need to choose a value less that 100%. Step 4: Just click OK. This will allow you to preview all the changes you made and you can also make any adjustments you may find necessary. If you want to speed up the play speed of a still image, you can change the duration of the still image. When you need to speed up videos on a regular basis, you want to make sure that you are using the best tool for that. And the best tool needs to be easy to use and allow you to do all the customizations that you need at a fast pace. If you're in this situation, one of the best software that you can use is Wondershare Filmora. When you're using Filmora to speed up videos, you just need to import them or to simply drag and drop from the User's Album to the video track on the Timeline. One of the best things about Filmora is that it supports many different file formats including the most famous ones such as MOV, MP4, AVI, MPG, WMV, or FLV, but also some file formats that are rarer such as EVO, TOD, NSV, TP, DAT, among many others. 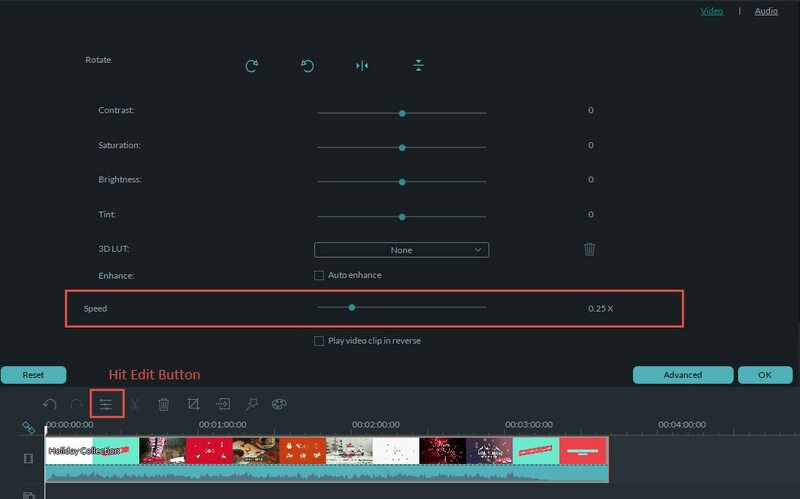 Just double click on the video that you want to speed up to open the editing panel, and choose the Speed option. Here, you just need to adjust the speed that you want considering that 1 is the original speed, 0.5 is half of the original speed, and 2 is the double of the original speed. You can either choose numbers such as 0.1, 0.2, 0.33, 10, etc. As soon as you're done, just click Create. You can then save your video on the format that you prefer.